We have had a wonderful summer full of ministry opportunities and enjoyable reunions. The annual BIO Training School was a blessed time of learning and fellowship. What made this year special is that we held our training sessions in the new BIO Training Center. This is the lower floor of our office building. The Training Center is in a “not quite complete” state. Using it in this condition helped us learn how we can better use the space while we can still make design changes. The classes were tremendous and I always learn from them. I taught two classes: one on communication and one on a technology topic. I trust the missionaries also benefited from this special week of training. Stephanie and I enjoyed a week of deaf camp at the Bill Rice Ranch together. Then I returned for a second week without her. I taught the first-time boys’ class and was able to pray with 4 young men as they accepted the Lord during camp. We had 16 young people trust the Lord as Savior during my two weeks at camp. There were 26 Deaf saved this summer at the Ranch. 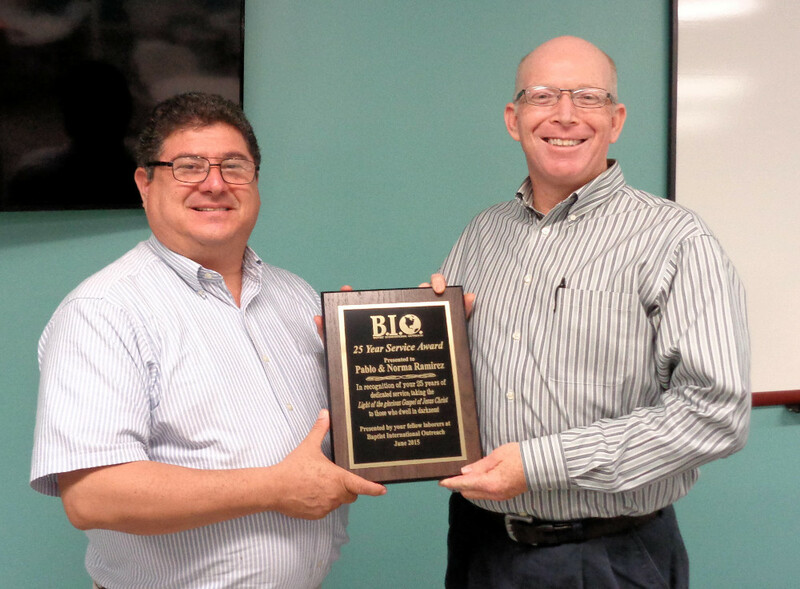 Pablo Ramirez working with BIO for 25 years. During Training School I always enjoy spending time with other missionaries. This year I had an extra special treat in that I got to be with my friend Pablo Ramirez from Costa Rica. It was an honor to present him with a 25-year service award as he and his wife have ministered to the Deaf through BIO these many years. Of course there were many old friends that we saw while serving at the Bill Rice Ranch this summer. We enjoyed seeing them all. Last week I met Kevin, a deaf man who recently moved to my area from the other side of the state. Kevin told me that he had gone to the Bill Rice Ranch as a camper during the 90s. Though I don’t specifically remember him, we were there at the same time. Kevin assured me that he was saved, but he wasn’t saved at the Ranch. His father was a pastor and clearly presented the Gospel to Kevin when he was a boy. I am thankful for parents—especially parents of the Deaf—who take an active role in teaching their children about the Lord. Thank you for continuing to help us carry the Gospel to those Deaf who aren’t privileged to learn about the Lord from their parents. A printable version of this letter is available for download in PDF format.